Abstract: Age-dependent modification of the facial subcutaneous white adipose tissue (sWAT) connected with reduction of its volume, modification of collagen content and adhesion between dermal and adipose layers can significantly influence mechanical stability of the skin and cause the development of aging symptoms such as wrinkles. Typical aging appearance in facial skin is at least partly connected with special phenotypical features of facial preadipocytes and mature adipocytes. In this paper, we have discussed the possible roles of local inflammation, compartmental structure of facial sWAT and trans-differentiation processes such as beiging of white adipocytes and adipocyte-myofibroblast transition in facial skin aging. It is widely accepted that skin stiffness, which is one of the main mechanical parameters defining the skin appearance, is continuously reduced in aging skin. Correspondingly, numerical non-invasive and minimal invasive antiaging strategies developed during the last years were mainly concentrated on the mechanical reinforcement of the skin connected with production of additional physiological or pathological collagen networks in the dermis. The increase of skin stiffness aimed by some accepted antiaging approaches is not fullfilled in reality. For example, regular long-term topical application of the 0.05% retinaldehyde reduced the skin stiffness by approximately 24% with simultaneous increase of its elasticity by 4%.1 Application of supra-physiological temperatures (which is typical for antiaging procedures based on application of the radio-frequency currents) was shown to reduce the skin stiffness by about 30% at 45°C and by about 50% at 50°C.2 These and several other experimental and clinical results clearly refute the assumption that the stand-alone reinforcement of the skin should causally improve the appearance of the aging skin. During the recent past, there was an increased evidence that the facial subcutaneous white adipose tissue (sWAT) could play an important role in skin aging and correspondingly must be involved as a target in the facial skin rejuvenation.3–6 Structure and volume of the sWAT are indeed significantly modified during aging. This modification is depot specific and connected with the loss of the sWAT volume and of its collagen network, which leads to a corresponding modification of the sWAT stiffness.7,8 Such modification can directly or indirectly influence the mechanical properties of the adjacent skin. Very recently, it was proposed that sWAT can directly influence the mechanical properties of such multi-layer mechanical composite as human skin. sWAT can change its effective thickness and mechanical moduli, whereas the degree of this modification must be strongly dependent on the type of mechanical loading applied to the skin as well as on the adhesion strength between the dermis and the sWAT.9 On the other hand, adipocytes from sWAT can physiologically interact with skin fibroblasts influencing their synthetic properties,10–12 which can indirectly modify the mechanical properties of the composite skin/sWAT. From here, it can be strongly assumed that a proper modification of the sWAT structure and volume can influence the mechanical properties of the overlying skin and modulate its resistance to structural alterations, which are typical for aging. Further, it can be supposed that at least one part of the characteristic facial modifications in aging can be connected with special structural and physiological properties of the facial sWAT and some special phenotypic features of the facial preadipocytes and adipocytes. In this article, we have discussed the role of sWAT in facial aging from this point of view. Facial adipocytes – what is different? Recently, it was demonstrated that human facial preadipocytes (adipose derived stem cells) exhibit very different properties compared with abdominal preadipocytes.13 Among others, it was shown that the facial preadipocytes exhibit much stronger differentiation in response to rosiglitazone, which is the agonist of the master adipogenic factor peroxisome proliferator-activated receptor gamma (PPRAγ). Proliferative and differentiative capacities of preadipocytes, which compose up to 50% of all cells in adipose tissue, are known to vary in different fat depots, being, for example, much higher in abdominal than in mesenteric or omental depots.14 Additionally, these capacities of preadipocytes are generally reduced during aging, and this effect was connected with decreased expression of PPRAγ in these cells.14 Facial preadipocytes were also more robust and retained their ability to differentiate in vitro through more passages than the corresponding abdominal cells. Stimulation of mature adipocytes with isoproterenol, which is a well-known β2-adrenergic receptor agonist, revealed a 2-fold greater release of glycerol from abdominal than from facial adipocytes. Reduced lipolytic activity of facial adipocytes was supported by investigation of β-adrenergic receptors, whereas the expression levels of β2-adrenergic receptor were reduced in facial mature adipocytes both in vitro (by 60%) and in vivo; the β3-adrenergic receptor was even non-detectable in facial adipocytes.13 These results clearly point to different physiological activity of facial and abdominal adipocytes. Comparing gene profiles of mature adipocytes from different depots also demonstrated significant differences between the facial and abdominal cells.13 The most striking discrepancy was observed for the homeobox (HOX) genes known to be involved in human adipogenesis,15 which were strongly downregulated in facial compared with abdominal adipocytes. This observation corresponds to the negative HOX gradient from the upper to the lower body areas, which was recently described.16 Such reduction in HOX expression in adipocytes can be connected with their inflammatory environment. For example, application of IL-1β was reported to cause up to 90% reduction in expression of some HOX genes.17 Unfortunately, the facial adipocytes in the study by Chon and Pappas13 were obtained during surgery without exact identification of the facial donor site. This leaves open whether the HOX expression varies between different facial fat compartments. Strongly reduced HOX expression is not the only remarkable phenotypic feature of the facial adipocytes. It was demonstrated that these cells exert an almost 9-fold increase in the type 2 iodothyronine deiodinases (DIO2) gene expression,13 which is normally downregulated in white adipocytes but is a well-known marker for brown adipocytes. This means that reduction of the facial sWAT volume in aging can be connected with all three possible mechanisms: reduction of the single cells’ volumes, reduction of the adipocytes’ number (through reduction of the number of preadipocytes in aging) and with “beiging” of white adipocytes, which is generally connected with volume reduction in these phenotypically modified cells. Notably, different fat compartments reveal distinct adhesive strengths between reticular dermis and sWAT, which, as it was stated very recently, can significantly influence the mechanical properties and optical appearance of the adjacent skin.9 Ghassemi et al described two types of facial compartments with different adhesive strengths.19 Compartments of the type 1 are characterized by a loose interface between the skin and sWAT and relatively weak adhesion between these layers. Such type of the fat pads was found in the medial and lateral midface, some parts of the periorbital area, and temple, forehead and neck.18 Fat compartments of the type 2 (perioral and nasal compartments) demonstrate strong adhesion between the skin and sWAT and correspond to the fibrous type of the adipose tissue. Since the adhesion between these layers determine transmission of mechanical forces between the sWAT layer and the skin,9 differences in the morphological structure of distinct facial compartments must be reflected in diverging aging patterns in corresponding skin areas. Adipocytes from different facial fat compartments exhibit distinct morphological properties. For example, it was reported that the adipocytes from the nasolabial compartment are significantly larger than the adipocytes from the deep medial cheek compartment.20 The average adipocyte size was dependent on the body mass index and demonstrated sexual dimorphism characterized by significantly larger fat depots in females than in males. Such morphological differences must be important in skin aging since the large but not the small adipocytes display inhibition of synthetic activity in adjacent fibroblasts,11 which can produce facial areas with spatially heterogenous mechanical properties. Taking together, facial preadipocytes and mature adipocytes have phenotypic features and morphological characteristics that vary between single facial compartments and strongly differ from corresponding features in abdominal adipocytes. Although modification of the sWAT thickness can significantly influence the mechanical properties of the adhered composite skin/sWAT,9 this is not the only factor contributing to the sWAT effect on the mechanical properties of the skin. Another important parameter is the collagen content of sWAT.18 Collagen network, being traditionally sub-divided in pericellular and intercellular matrix, but not the adipocytes primarily determines the mechanical properties of the sWAT layer.27,28 These two types of fibrotic structures are differently presented in various facial fat compartments, which determines the strong variations of the local mechanical properties even between two neighboring compartments.18 Generally, fibrotic content in the sWAT decreases with age, which can significantly weaken the mechanical properties of the composite skin/sWAT in aging. Indeed, knockout Col6KO mice lacking collagen VI, which is the main component of the pericellular fibrosis in sWAT, demonstrated 2-fold reduction of the Young’s modulus in sWAT.29 It should be also taken into account that the content of Col VI in sWAT demonstrates sexual dimorphism and varies significantly between different ethnic groups,30 which can partly explain the known sexual and ethnic differences in skin aging. Very recently, it was reported that fibrous content in the sWAT can be used as prognostic factor: high fibrous content negatively affects the fat reduction after bariatric surgery.31 Interestingly, no significant correlation was found between the average size of adipocytes and fibrotic content in the sWAT in this study. sWAT structure and its mechanical properties are known to be strongly modified by inflammation, which allows the question whether inflammation is involved in facial sWAT loss and thus in facial aging process. Local inflammation is an important factor generally causing some sWAT modification, but the particular result of this modification is qualitatively dependent on the inflammation strength. Although a moderate inflammation can lead to an expansion of sWAT, stronger inflammation can cause the involution of this layer.32,33 Local inflammation is typical not only for the sWAT areas adjacent to the skin lesions34,35 but also for the UV-irradiated areas.5 Mechanically, expansion or reduction of sWAT layer might evoke especially pronounced effects on the skin properties in the areas having compartmental structure, since the neighboring fat compartments can exhibit different volume modifications. Local inflammatory conditions in sWAT can also arise through secretion of cytokines or chemokines followed by migration of macrophages into this tissue. It should be, however, taken into account that more pro-inflammatory cytokines and chemokines are expressed by preadipocytes than by mature adipocytes,36 which means that the secretomes in different fat depots must be dependent on the ratio of immature/mature adipocytes. Preadipocytes were shown to have different cytokine secretion activities in distinct fat depots, and this effect seems to contribute to regional differences in adipose tissue-related inflammation. For example, omental preadipocytes produce more inflammatory cytokines and chemokines including IL-6, IL-8, chemokine (C-C motif) ligand 5, monocyte chemoattractant protein-1 and chemerin/retinoic acid receptor responder protein 2 than sWAT cells. These substances act as chemoattractants for monocytes and macrophages. Interestingly, it was shown that inhibition of Janus-activated kinase (JAK1/2) protein expression, which is known to transduce the IL-6 signaling, was able to blunt the chemoattraction by 40% in omental but not in sWAT.37 This means that there should be at least two different sources of inflammatory cytokines and chemokines, one of which is mediated via the JAK pathway. As we already mentioned, facial preadipocytes appear to be much more active than the abdominal adipocytes.13 Although the DOI2 expression by Chon and Pappas13 was investigated only in mature adipocytes and demonstrated significant upregulation in facial cells, it is known that this enzyme is also expressed in human preadipocytes.38 Moreover, DOI2 was shown to be connected with inflammation, and its suppression results in strong pro-inflammatory effects with increased expression of inflammatory mediators.39 Exposure of facial preadipocytes to conditioned medium from UVA-irradiated epidermal-dermal equivalents strongly inhibited the differentiation of these cells into mature adipocytes.21 At the same time, application of a cocktail containing the antibodies neutralizing IL-11, IL-1α, IL-6 and TNF-α significantly reduced the UV-induced inhibition of preadipocytes’ differentiation. Although the detailed information for the facial adipocytes from different fat compartments is actually absent, it can be strongly supposed that these compartments have different content and proliferative/differentiative activity of preadipocytes that provoke spatially different levels of inflammation via specific profiles of cytokine secretion. Adipose tissue macrophages play an important role in establishment of the inflammatory condition in sWAT. In obesity, which is considered as a chronic inflammatory state of WAT, adipose tissue becomes infiltrated by macrophages. It is believed that adipocyte death is sufficient to initiate macrophage infiltration and induce inflammation in sWAT. Indeed, obese mice and humans comprise considerably higher content of damaged adipocytes, which attract large number of tissue macrophages organized in the crown-like structures around the damaged fat cells.42 sWAT with high content of fibrotic structures demonstrates significantly lower density of the crown-like structures, which suggests that mechanically reinforced sWAT contains less dead adipocytes and thus attracts less M2 macrophages and demonstrates less inflammation.31 Since different facial fat compartments have very different content of fibrotic structures, it can be strongly assumed that they also have distinct content of proinflammatory macrophages. Recently, we have argued that the structure and physiological state of the local sWAT located underneath the lesional psoriatic skin play an important role in the pathophysiology of this disease.34,35 Very recently, it was indeed demonstrated that the local sWAT underlying the psoriatic lesions has mechanical properties that significantly differ from those for the non-lesional sWAT.48 This example clearly demonstrates the interplay between the skin and sWAT where inflammation is connected with modification of the mechanical properties of these layers. These novel insights seem to be of substantial therapeutic relevance. Specific suppression of inflammatory processes in the skin might induce the physiological phenotype of adipocytes and inhibit aging effects. 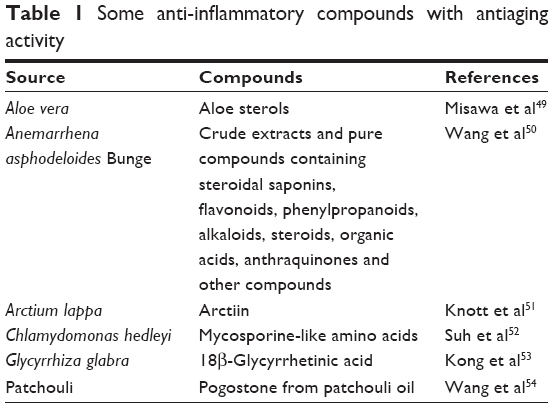 This idea is supported by the fact that a variety of anti-inflammatory compounds also demonstrate a certain antiaging activity (Table 1). Depending on the body location, physiological state and applied stimuli, adipocytes can demonstrate different trans-differentiations, which can lead to significant change of the local sWAT volume and thus directly influence the skin appearance. Further we will shortly discuss only two of these processes – “beiging” of white adipocytes and adipocyte-myofibroblast transition (AMT). Beiging leads to a local appearance of the fat cells that bear an intermediate phenotype between the white and brown adipocytes. White adipocytes are distributed throughout the body, contain unilocular droplets and sparse mitochondria and are generally considered as the storage side for energy surplus. Contrarily, beige adipocytes are significantly smaller and contain multilocular lipid droplets and numerous mitochondria that allow them to perform thermogenesis leading to reduction of the fat mass. Beige adipocytes in vivo do not produce a separate fat depot but are infiltrated in existing sWAT.55 Trans-differentiation of white adipocytes to beige adipocytes was long believed to be induced only by cold stimulation or by application of β-agonists.56 Recently, however, it was reported that such transformation takes place also in breast cancer,57 by overproduction of catecholamines,58 in the areas subjected to thermic burns,59,60 as well as by surgical injury.61 Particularly important for the facial aging discussed in this article could be that beiging was recently connected with depletion of white adipocytes progenitors,62 which takes place at least in chronological aging. In this context, we must once more mention the strongly increased expression of DIO2 genes in facial adipocytes observed in mature adipocytes,13 which supports the idea that beiging can be involved in modification of the facial sWAT. The diversity of conditions inducing beiging in white adipocytes indicates that this transformation is not exotic and might be involved not only in specific conditions in the fat tissue but also in its long-term development. It can be strongly assumed that any external factors that can cause a significant increase of the local metabolic activity in the adipose tissue can cause its beiging and thus modulate its volume. This effect can find a direct application in antiaging strategies. Currently dWAT is considered as a special fat depot containing the adipocytes with phenotypical properties that are different from those in the adipocytes located deep in sWAT.8 Among these properties are the unusually quick reaction times and trans-differentiation capacities. This explains the involvement of dermal adipocytes in such different physiological and pathological processes as wound healing, scarring, hair growth, skin innate immunity, skin thermoregulation and skin aging.5,8 Such diversity makes dWAT as an important target in different dermatological and aesthetic applications including future antiaging strategies. Modification of the sWAT structure must be considered as an important factor in facial aging. This concerns not only the volume reduction of sWAT that can be differently pronounced in various facial fat compartments, but also the age-dependent modification of adipocytes’ sizes, collagen content as well as adhesion between the skin and sWAT layers. All these factors can significantly influence the mechanical properties of the skin and reduce the critical mechanical strain needed for the production of structural instabilities such as wrinkles, which are typical for the aged skin. Facial preadipocytes and mature adipocytes have phenotypes, which in some important aspects strongly differ from the phenotypes of the corresponding abdominal cells. Such features as high proliferative and differentiative capacities of facial preadipocytes can be an important target in future antiaging strategies. Some phenotypic features of mature facial adipocytes as well as correlation between expression of inflammatory cytokines and loss of the facial sWAT point to potential involvement of inflammation in aging of this tissue, which should be reflected in the corresponding aging in the adjacent skin areas. Compartmental structure of the facial sWAT and different structural modifications of various compartments in aging connected with distinct ratios of preadipocytes to mature adipocytes as well as with different collagen content in these pads must be responsible for spatially heterogenous appearance of aging signs in the facial skin. ILK is the managing partner of Wellcomet GmbH. Wellcomet GmbH provided support in the form of salaries for ILK, but did not have any additional role in decision to publish or preparation of the manuscript. The commercial affiliation of ILK with Wellcomet GmbH does not alter the adherence to all journal policies on sharing data and materials. The other authors report no conflicts of interest in this work. Diridollou S, Vienne MP, Alibert M, et al. Efficacy of topical 0.05% retinaldehyde in skin aging by ultrasound and rheological techniques. Dermatology. 1999;199(Suppl 1):37–41. Lin M, Zhai X, Wang S, Wang Z, Xu F, Lu TJ. Influences of supra-physiological temperatures on microstructure and mechanical properties of skin tissue. Med Eng Phys. 2012;34(8):1149–1156. Sadick NS, Dorizas AS, Krueger N, Nassar AH. The facial adipose system: its role in facial aging and approaches to volume restoration. Dermatol Surg. 2015;41(Suppl 1):S333–S339. Marten TJ, Elyassnia D. Fat grafting in facial rejuvenation. Clin Plast Surg. 2015;42(2):219–252. Kruglikov IL, Scherer PE. Skin aging: are adipocytes the next target? Aging (Albany NY). 2016;8(7):1457–1469. Trivisonno A, Rossi A, Monti M, et al. Facial skin rejuvenation by autologous dermal microfat transfer in photoaged patients: clinical evaluation and skin surface digital profilometry analysis. J Plast Reconstr Aesthet Surg. 2017;70(8):1118–1128. Donato AJ, Henson GD, Hart CR, et al. The impact of ageing on adipose structure, function and vasculature in the B6D2F1 mouse: evidence of significant multisystem dysfunction. J Physiol. 2014;592(18):4083–4096. Kruglikov IL, Scherer PE. Dermal adipocytes: from irrelevance to metabolic targets? Trends Endocrinol Metab. 2016;27(1):1–10. Kruglikov IL, Scherer PE. General theory of the skin reinforcement. PLoS One. 2017;12(8):e0182865. Ezure T, Amano S. Influence of subcutaneous adipose tissue mass on dermal elasticity and sagging severity in lower cheek. Skin Res Technol. 2010;16(3):332–338. Ezure T, Amano S. Negative regulation of dermal fibroblasts by enlarged adipocytes through release of free fatty acids. J Invest Dermatol. 2011;131(10):2004–2009. Ezure T, Amano S. Increment of subcutaneous adipose tissue is associated with decrease of elastic fibres in the dermal layer. Exp Dermatol. 2015;24(12):924–929. Chon SH, Pappas A. Differentiation and characterization of human facial subcutaneous adipocytes. Adipocyte. 2015;4(1):13–21. Sepe A, Tchkonia T, Thomou T, Zamboni M, Kirkland JL. Aging and regional differences in fat cell progenitors – a mini-review. Gerontology. 2011;57(1):66–75. Procino A, Cillo C. The HOX genes network in metabolic diseases. Cell Biol Int. 2013;37(11):1145–1148. Dani C, Foissac R, Ladoux A, Chignon-Sicard B. Autologous fat grafts: can we match the donor fat site and the host environment for better postoperative outcomes and safety? Curr Surg Rep. 2017;5(7):14. Weiss G, Goldsmith LT, Taylor RN, Bellet D, Taylor HS. Inflammation in reproductive disorders. Reprod Sci. 2009;16(2):216–229. Kruglikov I, Trujillo O, Kristen Q, et al. The facial adipose tissue: a revision. Facial Plast Surg. 2016;32(6):671–682. Ghassemi A, Prescher A, Riediger D, Axer H. Anatomy of the SMAS revisited. Aesth Plast Surg. 2003;27(4):258–264. Wan D, Amirlak B, Giessler P, et al. The differing adipocyte morphologies of deep versus superficial midfacial fat compartments: a cadaveric study. Plast Reconstr Surg. 2014;133(5):615e–622e. Li WH, Pappas A, Zhang L, Ruvolo E, Cavender D. IL-11, IL-1α, IL-6, and TNF-α are induced by solar radiation in vitro and may be involved in facial subcutaneous fat loss in vivo. J Dermatol Sci. 2013;71(1):58–66. Gerth DJ. Structural and volumetric changes in the aging face. Facial Plast Surg. 2015;31(1):3–9. Wysong A, Kim D, Joseph T, MacFarlane DF, Tang JY, Gladstone HB. Quantifying soft tissue loss in the aging male face using magnetic resonance imaging. Dermatol Surg. 2014;40(7):786–793. Gierloff M, Stöhring C, Buder T, Gassling V, Açil Y, Wiltfang J. Aging changes of the midfacial fat compartments: a computed tomographic study. Plast Reconstr Surg. 2012;129(1):263–273. Gosain AK, Klein MH, Sudhakar PV, Prost RW. A volumetric analysis of soft-tissue changes in the aging midface using high-resolution MRI: implications for facial rejuvenation. Plast Reconstr Surg. 2005;115(4):1143–1152. Le Louarn C, Buthiau D, Buis J. Structural aging: the facial recurve concept. Aesthetic Plast Surg. 2007;31(3):213–218. Comley K, Fleck NA. A micromechanical model for the Young’s modulus of adipose tissue. Int J Solid Struct. 2010;47(21):2982–2990. Kruglikov IL. General theory of body contouring: 2. Modulation of mechanical properties of subcutaneous fat tissue. J Cosmet Dermatol Sci Appl. 2014;4(2):117–127. Lackey DE, Burk DH, Ali MR, et al. Contributions of adipose tissue architectural and tensile properties toward defining healthy and unhealthy obesity. Am J Physiol Endocrinol Metab. 2014;306(3):E233–E246. Khan T, Muise ES, Iyengar P, et al. Metabolic dysregulation and adipose tissue fibrosis: role of collagen VI. Mol Cell Biol. 2009;29(6):1575–1591. Bel Lassen P, Charlotte F, Liu Y, Bedossa P, et al. The FAT score, a fibrosis score of adipose tissue: predicting weight loss outcome after gastric bypass. J Clin Endocrinol Metab. 2017;102(7):2443–2453. Asterholm IW, Tao C, Morley TS, et al. Adipocyte inflammation is essential for healthy adipose tissue expansion and remodeling. Cell Metab. 2014;20(1):103–118. Kruglikov IL, Scherer PE, Wollina U. Are dermal adipocytes involved in psoriasis? Exp Dermatol. 2016;25(10):812–813. Kruglikov IL, Wollina U. Local effect of adipose tissue in psoriasis and psoriatic arthritis. Psoriasis Target Ther. 2017;7:17–25. Harkins JM, Moustaid-Moussa N, Chung YJ, et al. Expression of interleukin-6 is greater in preadipocytes than in adipocytes of 3T3-L1 cells and C57BL/6J and ob/ob mice. J Nutr. 2004;134(10):2673–2677. Zhu Y, Tchkonia T, Stout MB, et al. Inflammation and the depot-specific secretome of human preadipocytes. Obesity (Silver Spring). 2015;23(5):989–999. Nomura E, Toyoda N, Harada A, et al. Type 2 iodothyronine deiodinase is expressed in human preadipocytes. Thyroid. 2011;21(3):305–310. Cheng AW, Bolognesi M, Kraus VB. DIO2 modifies inflammatory responses in chondrocytes. Osteoarthritis Cartilage. 2012;20(5):440–445. Mandeville I, Aubin J, LeBlanc M, et al. Impact of the loss of Hoxa5 function on lung alveogenesis. Am J Pathol. 2006;169(4):1312–1327. Dankel SN, Fadnes DJ, Stavrum AK, et al. Switch from stress response to homeobox transcription factors in adipose tissue after profound fat loss. PLoS One. 2010;5(6):e11033. Cinti S, Mitchell G, Barbatelli G, et al. Adipocyte death defines macrophage localization and function in adipose tissue of obese mice and humans. J Lipid Res. 2005;46(11):2347–2355. Hwang DH, Kim JA, Lee JY. Mechanisms for the activation of Toll-like receptor 2/4 by saturated fatty acids and inhibition by docosahexaenoic acid. Eur J Pharmacol. 2016;785:24–35. Orr JS, Puglisi MJ, Ellacott KL, Lumeng CN, Wasserman DH, Hasty AH. Toll-like receptor 4 deficiency promotes the alternative activation of adipose tissue macrophages. Diabetes. 2012;61(11):2718–2727. Chawla A, Nguyen KD, Goh YP. Macrophage-mediated inflammation in metabolic disease. Nat Rev Immunol. 2012;11(11):738–749. Boutens L, Stienstra R. Adipose tissue macrophages: going off track during obesity. Diabetologia. 2016;59(5):879–894. Bai Y, Sun Q. Macrophage recruitment in obese adipose tissue. Obes Rev. 2015;16(2):127–136. Dattola A, Altobelli S, Marsico S, et al. Hypodermal adipose tissue sonoelastography for monitoring treatment response in patients with plaque psoriasis. Photomed Laser Surg. 2017;35(9):484–491. Misawa E, Tanaka M, Saito M, et al. Protective effects of Aloe sterols against UVB-induced photoaging in hairless mice. Photodermatol Photoimmunol Photomed. 2017;33(2):101–111. Wang Y, Dan Y, Yang D, et al. The genus Anemarrhena Bunge: a review on ethnopharmacology, phytochemistry and pharmacology. J Ethnopharmacol. 2014;153(1):42–60. Knott A, Reuschlein K, Mielke H, et al. Natural Arctium lappa fruit extract improves the clinical signs of aging skin. J Cosmet Dermatol. 2008;7(4):281–289. Suh SS, Hwang J, Park M, et al. Anti-inflammation activities of mycosporine-like amino acids (MAAs) in response to UV radiation suggest potential anti-skin aging activity. Mar Drugs. 2014;12(10):5174–5187. Kong SZ, Chen HM, Yu XT, et al. The protective effect of 18β-Glycyrrhetinic acid against UV irradiation induced photoaging in mice. Exp Gerontol. 2015;61:147–155. Wang XF, Huang YF, Wang L, et al. Photo-protective activity of pogostone against UV-induced skin premature aging in mice. Exp Gerontol. 2016;77:76–86. Wankhade UD, Shen M, Yadav H, Thakali KM. Novel browning agents, mechanisms, and therapeutic potentials of brown adipose tissue. BioMed Res Int. 2016;2016:2365609. Rio MC, Dali-Youcef N, Tomasetto C. Local adipocyte cancer cell paracrine loop: can “sick fat” be more detrimental? Horm Mol Biol Clin Investig. 2015;21(1):43–56. Frontini A, Vitali A, Perugini J, et al. White-to-brown transdifferentiation of omental adipocytes in patients affected by pheochromocytoma. Biochim Biophys Acta. 2013;1831(5):950–959. Sidossis LS, Porter C, Saraf MK, et al. Browning of subcutaneous white adipose tissue in humans after severe adrenergic stress. Cell Metab. 2015;22(2):219–227. Patsouris D, Qi P, Abdullahi A, et al. Burn induces browning of the subcutaneous white adipose tissue in mice and humans. Cell Rep. 2015;13(8):1538–1544. Longchamp A, Tao M, Bartelt A, et al. Surgical injury induces local and distant adipose tissue browning. Adipocyte. 2016;5(2):163–174. Daquinag AC, Tseng C, Salameh A, et al. Depletion of white adipocyte progenitors induces beige adipocyte differentiation and suppresses obesity development. Cell Death Differ. 2015;22(2):351–363. Berry DC, Jiang Y, Arpke RW, et al. Cellular aging contributes to failure of cold-induced beige adipocyte formation in old mice and humans. Cell Metab. 2017;25(1):166–181. Graja A, Schulz TJ. Mechanisms of aging-related impairment of brown adipocyte development and function. Gerontology. 2015;61(3):211–217. Shin W, Okamatsu-Ogura Y, Machida K, Tsubota A, Nio-Kobayashi J, Kimura K. Impaired adrenergic agonist-dependent beige adipocyte induction in aged mice. Obesity (Silver Spring). 2017;25(2):417–423. Zeng X, Jedrychowski MP, Chen Y, et al. Lysine-specific demethylase 1 promotes brown adipose tissue thermogenesis via repressing glucocorticoid activation. Genes Dev. 2016;30(16):1822–1836. Duteil D, Tosic M, Willmann D, Georgiadi A, Kanouni T, Schüle R. Lsd1 prevents age-programed loss of beige adipocytes. Proc Natl Acad Sci U S A. 2017;114(20):5265–5270. Kuwazuru O, Miyamoto K, Yoshikawa N, Imayama S. Skin wrinkling morphology changes suddenly in the early 30s. Skin Res Technol. 2012;18(4):495–503. Marangoni RG, Korman BD, Wei J, et al. Myofibroblasts in murine cutaneous fibrosis originate from adiponectin-positive intradermal progenitors. Arthritis Rheumatol. 2015;67(4):1062–1073. Varga J, Marangoni RG. Systemic sclerosis in 2016: dermal white adipose tissue implicated in SSc pathogenesis. Nat Rev Rheumatol. 2017;13(2):71–72. Mitani H, Koshiishi I, Toyoda H, Toida T, Imanari T. Alterations of hairless mouse skin exposed to chronic UV irradiation and its prevention by hydrocortisone. Photochem Photobiol. 1999;69(1):41–46. Kruglikov IL. Interfacial adipose tissue in systemic sclerosis. Curr Rheumatol Rep. 2017;19(1):4. Ruzehaji N, Avouac J, Elhai M, et al. Combined effect of genetic background and gender in a mouse model of bleomycin-induced skin fibrosis. Arthritis Res Ther. 2015;17(1):145. Kruglikov IL, Scherer PE. Adipocyte-myofibroblast transition as a possible pathophysiological step in androgenetic alopecia. Exp Dermatol. 2017;26(6):522–523.